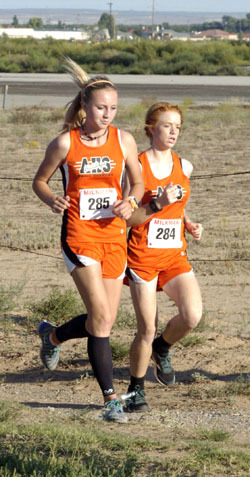 For the Bulldog and Lady Bulldog cross country teams, it was all about finishing strong Nov. 7 at the Class 5A State Meet in Rio Rancho – for themselves, for their coach, and for a lost teammate and mentor. They did all of the above proud. 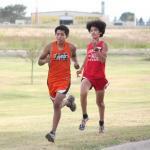 Against adversity both on and off the course, the Artesia runners improved their times and gained the experience they’ll need to come back competitive in 2016. 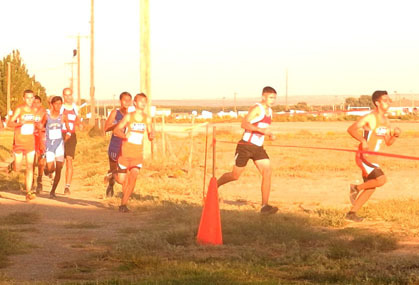 The Bulldogs placed 14th overall as a team, led by junior Julius Acosta in 41st place with a time of 17:57.35. Not far behind in 46th place was Hunter Ash with a time of 18:01.55, followed by Eliazar Granillo (61st, 18:29.90), Felipe Salamanca (83rd, 19:09.10), Kale Mauritsen (92nd, 19:38.50), Isaac Lopez (93rd, 19:45.65) and Fabian Perez (95th, 19:57.30). The Lady Bulldogs were unfortunately forced to contend with a few race-day shakeups but fought through them valiantly. Perhaps the biggest was the sidelining of top-two runner Madilynn Moon due to illness. Top-three runner Katelynn Sullivan suffered a severe cramp a mile-and-a-half in that put her out of the race, and Lauren Robson became ill mid-run but managed to finish. Sophomore Michaela Phipps crossed the line first in 67th overall for the Lady ‘Dogs with a time of 23:07.25, Lexi Montgomery was 73rd with a 23:22.80, Ali Mauritsen 76th, 23:31.45, Joslyn Madrid 90th, 24:42.60, and Robson 92nd, 24:56.70. And experience is the name of the game for a program that will lose just a single senior this year in Dana Thalman. The boys’ program will graduate eight seniors this year in Ash, Salamanca, Perez, Ben Beverage, Isaac Gutierrez, Jose Tesillo, Rafael Molina and Michael McEachern but return a solid core to their varsity lineup. The whole of the 2015 season was a difficult one for the AHS runners. The program lost Marquise’ Weast, who would have returned this year for her senior season, in the spring and longtime coach, mentor and friend Marcos Morillon Aug. 23. But although they spent the year running with heavy hearts, Ebarb feels the losses inspired the athletes to give their best effort in tribute to the two.